Why you run: It makes me happy and I’m a certified grouch if I miss a run. I also enjoy the work/reward part of it. Training is the work and the race (not the medal) is the reward. Running is simple in theory, but it’s a very hard sport and can be a grind at times. All of those things make me want it in my life. When did you get started running: I was a sprinter in high school (Herndon) but didn’t start running again seriously until 2012/2013. Looking back, I probably ran the wrong events in high school, but had a blast with my friends, so I wouldn’t change a thing. Have you taken a break from running: Yes. I was totally burned out after Richmond Marathon this past November and just didn’t feel like getting out to run anymore. The whole thing seemed like a chore and the thought of running, let alone racing, just didn’t appeal to me anymore. So I stopped “officially” training, skipped every race I’d signed up for and ran only when I felt like it. It took the first four months of this year to get over the hump, but I’m finally enjoying it again. Coach or training group: Northern Virginia Running Club. I found NOVA a few years ago and joining was one of the best running decisions I’ve made. We aren’t the largest club, but the support and fellowship within the group is amazing. Having a top coach like Jerry Alexander running our Tuesday track practices is an extra bonus. The hardest race you’ve ever run: 2017 Grant-Pierce Indoor Marathon. 200 something laps on a 200 meter indoor track. I think there were only 20 of us running that day, but it’s one of those races that makes a person proud to say they ran and finished, no matter the finishing time. Most adventurous decision you’ve made with your running: Running Marines Corps and Richmond Marathon two weeks apart. My first marathon ever was the 2016 Marines Corps Marathon. I missed out on the lottery, so I signed up for Richmond. But I was able to get a bib for Marines Corps via transfer and from there figured, what the hell, just run both. I did it again in 2017. Running mentors: My buddy Alex Mischke. We met working for a consulting firm about 8 years ago and at the time I was 45 pounds overweight and fake exercising. His advice got me on the path to losing weight and running my first 10 miler and half marathon, which, at the time, seemed impossible. My NOVA teammates Mike Naff and Greg Swiatocha. Both of these guys are fearless hard workers. Mike was my inspiration for running the back to back marathons and the Grant Pierce race. In both instances I just thought, “Coast Guard Mike would probably do that.” Greg is one the hardest workers I know. He just runs. You can see the pain on his face during the run, but he doesn’t complain about the workout, or the race, he just runs. My favorite place to run in the D.C. area is: My neighborhood in Hayfield/Kingstowne. I can run anywhere from 5 miles to 20 in a perfect loop if I go left or right. The Arlington loop is a close second though. My best race was: 2017 Cherry Blossom. 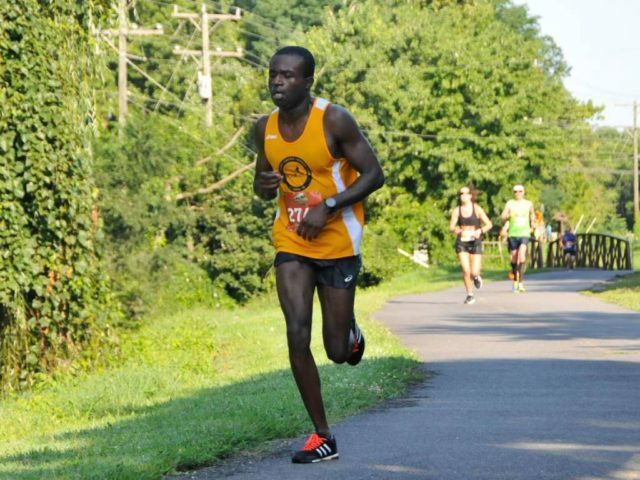 The ten miler is my favorite race distance, I was in the middle of a good training cycle and the weather was perfect. I missed my goal time by probably 30 seconds, but still ran a 10 mile PR. Marines Corps Marathon is a close second though. The volunteers and spectators on the course are unbelievable.Marathons are hard and having that much support really helps in getting through the rough patches. Ideal post-run meal: Overnight Oats (oatmeal, almond milk, blueberries, raspberries, plain greek yogurt, peanut butter) Post race though? French Toast, Bacon, eggs, coffee. Pet peeve: People who don’t use Strava. I mean c’mon, we all know it’s the best. Goals: Never thought I’d say it, but to qualify for Boston within the next year (or two) at most. The qualifying time is difficult, but I want the challenge. Your advice for a new runner: Give yourself time. When I started back up in 2012, I could barely finish the 1.5 loop around my neighborhood. My first 5k in 2012 took 37 minutes. It’s taken 6 years and I still have a long way to go. So don’t get discouraged. Set goals and work towards them. Favorite running book: Road Racing For Serious Runners by Pete Pfitzinger. It’s basically by running reference guide and is my go-to for any questions. Song in your head during a run: Usually nothing, unless it’s some jingle my 5 year old has been repeating non-stop. When I got back into running, I tried listening to music and remember thinking; “that song took 6 minutes, so I must’ve run a mile.” Nope. Only half a mile. So no songs in my head. Have you dealt with a major injury: Luckily no. I’ve had a few overuse scares, but nothing serious. Running quote: I’m not a big quote guy, but Des Linden’s “Keep showing up” quote stuck with me and got me out of the running burnout funk I experience earlier this year. Why is the D.C. area a great place to be a runner: The running community is so inclusive and supportive ,there’s no excuse to not run. There are trails everywhere, multiple races every weekend, numerous running clubs, tracks, etc… If a person wants to get into the sport, there’s no better place to start than the DC area.